A rich effect of color and design. Large polygon with red background. Black background on center an border. Blue, golds and greens. 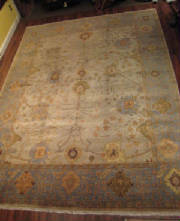 New Indian Oushak style Area Rug 9' x 12"
Subtle coloring and design in ancient geometric floral Oushak motif. Blue green, brown, gold, gray. 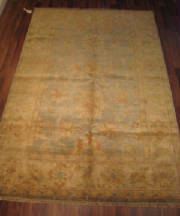 Oushak Indian Rug 6' x 8'10"
Silvery green/blue with orange and gold. Colors and sheen change with nap. 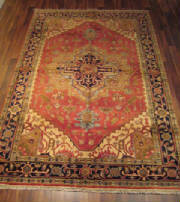 Traditional Turkish Oushak design transformed in Indian handweaving. 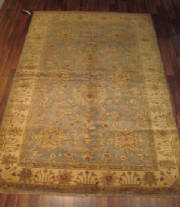 Significant change in color and sheen according to nap--variety in one rug! Gray background with gold, rust, green and red. Handmade in India utilizing ancient Oushak geometric floral designs.